The Imorgon Ultrasound Enhancement System™ delivers the ultrasound functionality PACS does not provide, restoring excellence in ultrasound along the five critical dimensions depicted in the illustration to the right. Sonographers and radiologists can work more effortlessly, precisely and productively. Communication between them—and with remote sites—becomes more consistent and accurate as well. And the Imorgon System can grow with your department, enabling future integration of ultrasound specialty features such as 3D/4D, reporting and contrast viewing. 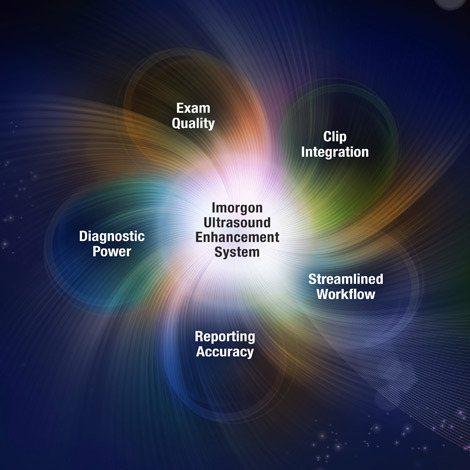 In this Affordable Care Act era, Imorgon’s focus on ultrasound excellence is helping leading health care organizations achieve the goals of meaningful use, including improved quality, safety and efficiency. Our experience in ultrasound workflow analysis, combined with a consultative, client-centered approach, will help you improve your radiology department’s overall performance and effectiveness.